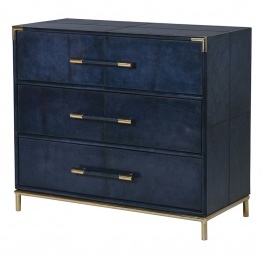 La Maison Chic offers an amazing selectionof chest of drawers. If there is one furniture that serves almost every storage purpose, then that this is one.It is a multi-purpose piece of furniture that is a must-have in every house. A chest of drawers can be narrow and tall or short and wide. Some customers require piece with numerous drawers, others are just looking for a small nightstand. 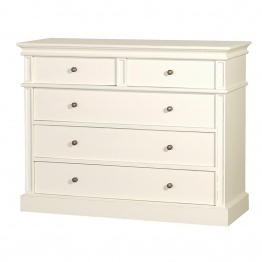 Customers particularly look for French chest of drawers if they go for a classical style look in the room. The main purpose of the chest of drawers in the bedroomis to serve the purpose of storing the essentials. From the outside, chest of drawers is an interesting piece of furniture that occupies a space in the bedroom and acts as a great storage space. Whether a chest of drawers is decorative or utilitarian, big or small, there is a huge amount of objects which can be stored in them. Having something like this in your house would surely keep things organized. But apart from being useful, drawers can serve multiple other purposes. The top of the drawers can be used to display photos, plants and other show pieces. For a small chest, you may consider keeping lamps, books, candles and flowers on display. Think about the entire decorating scene of your room. For a country style room, a reclaimed pine chest of drawers would look great. For an antique or classic look, go for French chest of drawers or Rococo chest of drawers. Keep in mind the size of your room. You may not want the chest to take up half of your room. There are many types of drawers available at La Maison Chic. While they differ in style and design, their basic function remains the same. Large and luxurious-These are commonly known as tallboys or the British version. These are made with two separate pieces. The base has a chest of drawers and has an upper drawer on top. 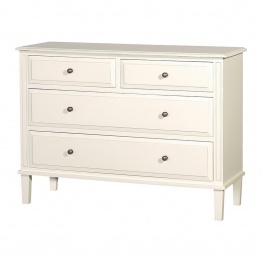 Low and pretty- Such drawers can be seen both in the bedroom or living room. If it is kept in the bedroom, putting a mirror on top would look great. It is commonly called a desk dresser. In this chest of drawers, you can keep the essential toiletries. Common styles- Bombe dressers have curve on the sides. This adds to the beauty quotient of the chest of drawers. The straight fronts add to the balance of the outlook of the furniture. Chest of drawers is undoubtedly a necessary piece of furniture. It is important to pick a correct styleto suit your choice as well the room décor. For storage purposes, there can be no better item of furniture than this one. Depending upon the utility, you have to choose your chest. For more storage, go for a broad and tall one.